Although men could improve their family’s status by their own efforts, which might be rewarded by prestigious appointments, a knighthood or even elevation to the peerage, status in the time of Guto’r Glyn continued to depend upon lineage as well. The poets prided themselves on knowing the ancestry of their patrons, many of whom could trace their lineage back to the Welsh princes of the twelfth and thirteenth centuries and beyond. 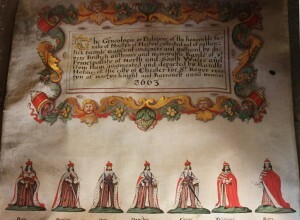 Praising noble Welsh descent was particularly important in the case of patrons whose connection with the cultural life of Wales was not immediately apparent, such as John Talbot, second earl of Shrewsbury (see poem 78.39-40). Though it had begun as a means of identifying individuals on the battlefield, by the fifteenth century heraldry had developed into a highly formalized system and a family’s coat of arms was strongly associated with their lineage and hereditary rights. A similar but less formal system of emblems was used for badges and collars, which were worn as signs of allegiance to a great family or a political cause. Seals, too, bore motifs, often heraldic, that could be passed down the generations.